This is a short, compact plant...so different from other Gauras I have. I always think of these white Gauras as "happy" plants (don't know why). Has it proven hardy, or is it a new one this year? It's new this year. Meanie - I found it at a new Nursery who only have a small selection of plants, but always something different. They can only open 3 days a week while they get established. It's lovely, isn't it, G! That is lovely , I do like that ! Thanks, Tt. I just hope it survives this winter! was it easily available to purchase ? No - it came from a new Nursery where two sisters started a new business earlier this year. They can only open three days a week until business picks up, but they stock unusual plants. It's always very tempting there. I think they're going to close down for a month or more after Christmas - they're selling home-made decorations at the moment. Oh, I do agree, Tt. It's quite a way from here, but well worth it when I do manage a visit. I have my name on their e-mail list, and all credit to them - they're running all kinds of 'special' events, like talks and visits from tool -sharpeners to get people in. That has to be the vital thing - once people get to hear about them, they should do well. They have the will to succeed, that's for sure. get all your tools sorted in one go ! It was when I was very unwell, or I'd have been down there like a shot! I thought that was a real brainwave on their part. I hope they get him back again next year. 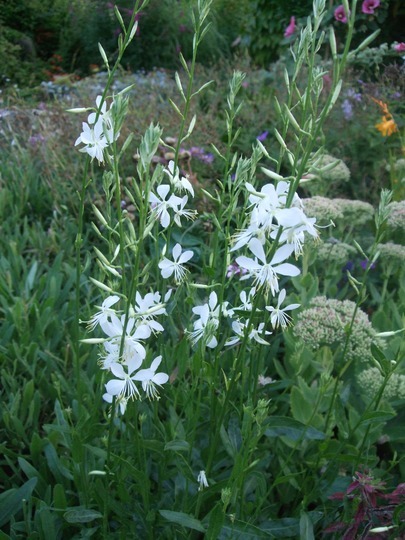 See who else is growing Gaura lindheimeri (Gaura). See who else has plants in genus Gaura.